This large mosquito has 3 different colored sets of legs - white, yellow and red. He also has a stripey blue and white body. 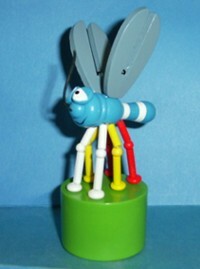 His proboscis made of flexible black wire. Great push action and even greater goofy expression on his face. Height just under 5 inches.